Spacious 3 bedroom bungalow with 3 bathrooms offered for sale, fully furnished, on the secure residential SP2 Village. The house has a large lounge and dining area, with plenty of windows to give it a bright airy feel. There is a modern European fitted kitchen which incorporates a good sized storage room on the side. The 3 bedrooms are all a good size, and the house is air conditioned throughout. There is a secluded peaceful seating area in the garden, with fan. This house has an electric entrance gate and a private alarm system. SP2 is a very well managed village, and features a communal pool, children’s play area, fitness room and 24 hour security. 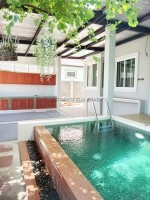 It is located 4km from Sukhumvit Road, close to many local Thai markets, convenience stores and restaurants. The title deed is registered in company name, making ownership easy and inexpensive.